Explore and download the free Word Document templates below to build your own personalized documents. Letter of Intent (LOI) A Letter of Intent (LOI) is a short non-binding contract that precedes a binding agreement, such as a share purchase agreement or asset purchase agreement. Confidential Information Memorandum A Confidential Information Memorandum (CIM) is a document used in mergers and acquisitions to convey important information about a business that’s for sale including its operations, financial statements, management team, and other data to a prospective buyer. 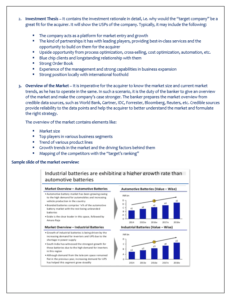 Investment Banking Cover Letter This template shows you how to write a cover letter for investment banking. 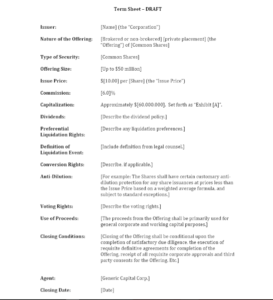 Term Sheet A term sheet outlines the basic terms and conditions under of an investment opportunity and is a non-binding agreement that serves as starting point for more detailed agreements, like a commitment letter, definitive agreement (share purchase agreement), or subscription agreement. Resignation Letter A resignation letter is an official letter sent by an employee to their employer giving notice they will no longer be working at the company. Investment Banking Resume The Investment banking resume is tailored to the industry standard to avoid being immediately deleted if they don’t comply with the standard format. ECM Deals Committee Memo An Equity Capital Markets (ECM) Memo is generated internally at an investment bank to approve a potential transaction. Cover Letters Three different cover letter templates which you can use to create your personalized letter. 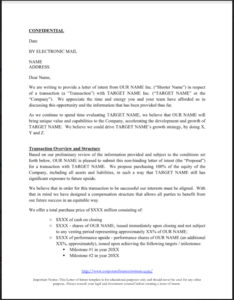 Business Letter Format This business letter format template provides you the proper structure for writing a formal business letter. Business Model Canvas The business model canvas is used to help you illustrate, summarize, and plan your company's business plan in a single page.